Using a state of-the-art optical sensing chamber. 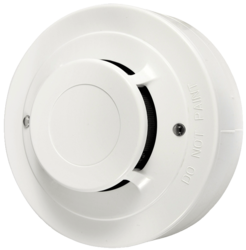 LEDs on each detector provide local 360° visible alarm indication. Flash every 3~5 seconds indicating that power is applied and the detector are working properly. LEDs will be off when a trouble condition exists indicating that the detector sensitivity is outside the listed limit. Dustproof, moth-proof, anti-light interference design. Established in the years 2010, we “Agni Junction Fire Services” are located in Delhi. Our product range comprises of Conventional Fire Alarm Panels, Addressable Fire Alarm Panels, Wireless Fire Alarm Panels, Electrical Control Panels, Emergency Light, Conventional Detector, Fire Alarm Hooter and many more. Our commitment to exceptional quality products is the foundation of our company's strength. It is our desire to deliver a fire protection system our clients that is engineered, prepared and installed with only the highest of quality. Our qualified professionals are committed to work in close coordination with the clients. Our offered products are highly applauded for features such as outstanding performance, durability and fine functionality etc. We take into consideration the set industry norms and guidelines while preparing our products.